[By Róisín Curé in Galway] A few years ago, I made my first few forays into urban sketching on the island of Mauritius. I'd just arrived, and I didn't know my way around, never mind what the big scary public would DO to a lone woman sketching. I was terrified about drawing out on the streets. I hadn't actually imagined any of the awful things that could happen - it was just general fear. 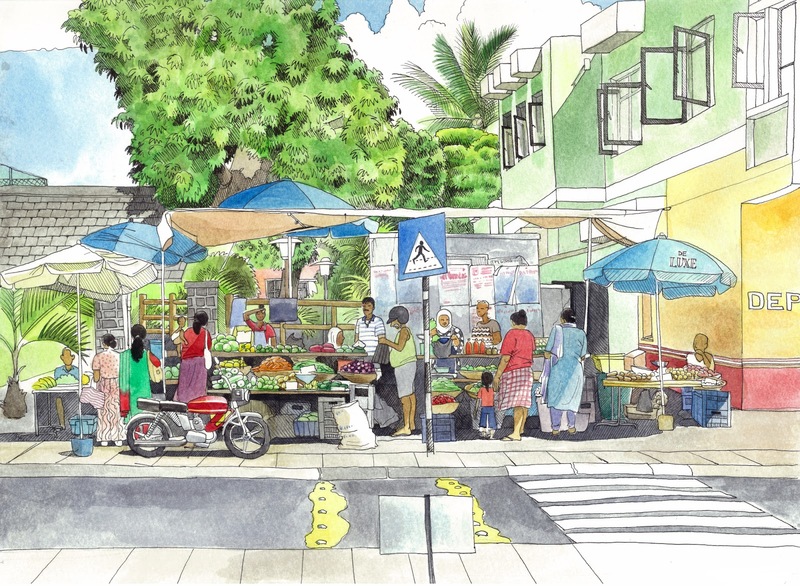 Nonetheless, just two weeks after being given a book on urban sketching, I found myself looking for somewhere to sit across the street from a market stall in the crazy, noisy, chaotic Mauritian country town of Triolet, in sweltering heat. I had a huge straw hat on and enormous dark glasses, and I was listening to a local radio station via earphones - my feeble attempt at armour. There was a blue kiosk to my right covered in a Pepsi-Cola logo, selling fast food of some sort. I could make out the top of the head of the vendor sitting inside. I avoided eye contact as I passed and took up position. Boy, was I hostile. I got the sketch underway and ignored everyone. After a few minutes the vendor came out from his kiosk. He was tiny - smaller than he'd seemed behind the counter. He was quite plump and had black spiky gelled hair (male Mauritians take their appearance very seriously). Without a word he put a sign in front of me. I couldn't see what it said and continued to ignore him. He turned the sign around to show me. It read "NO PARKING". "Now no one will block your view," he said. "Thank you," I said. "That's so kind of you." On I sketched. You can see the back of the sign in the drawing. When I finished I showed the vendor my sketch. He was delighted. "You should draw the temple," he said. "It's one of the most beautiful in Mauritius." "The Tamil temple?" I asked. He looked annoyed. "No, the Hindu temple. I live just opposite." He drew me a rudimentary map, and he told me that his brother was a big cheese of some sort (I didn't understand what) within the temple. He clearly felt a sense of ownership over it. Anyway, Niteen (the fast food vendor in the blue kiosk) and I started chatting. We talked about the holy lake of Grand Bassin, a site of pilgrimage for Hindus, and he told me about his wife and two children. "When it comes to children, I believe in quality, not quantity," he said, and shared some of his uncompromising views on divorced ladies having children they couldn't afford, which I challenged. But he was generally very good-natured, and before I left, he insisted on giving me a huge bag of his wife's samosas and gâteaux piments. I refused, because I was frightened of eating street food. Niteen demanded to know why I wouldn't take the food, and was starting to take offence. I could hardly accuse him - and by extension, his wife - of selling bad food, so in the end I took it, starting a terrible addiction to the delicious, cheap and perfectly safe Mauritian street food. I did sketch the Hindu temple of which Niteen was so proud. He wasn't there the day I drew it, so I came and went unnoticed. But the samosas and gâteaux piments Niteen had given me were so good that I went back for more, taking my husband with me to meet Niteen. I showed Niteen the drawing I'd done of the temple. He was thrilled. "Your wife has a gift!" he said to my husband. "You must protect her, and God will reward you." When we got back to the car, it was all I could do to keep a straight face. "I have a gift, and you must protect me," I said. I got to know Niteen better over the next few months. 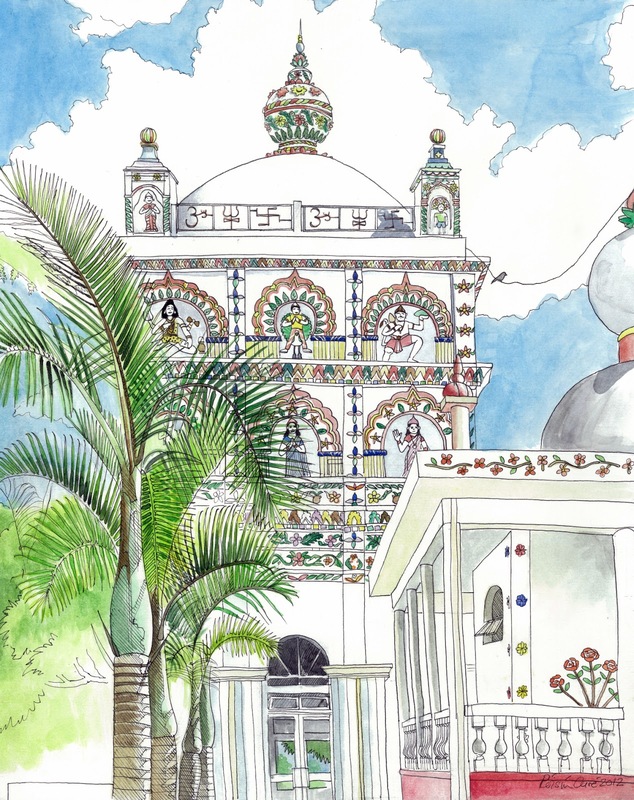 I gave him a copy of the sketch of the temple and he always insisted on giving me those delicious samosas for a few pence. I'd question the amount, but he would never take any more. When my mother came to visit, he welcomed her warmly. "You must bring Maman to hear the birds," he said. There is an enormous banyan tree at the entrance to the temple, and at sundown every evening the cacophony of mynah birds roosting in the banyan for the night has to be heard to be believed. That evening, when I brought my mother and the rest of the family to hear the birds, we visited the temple with all its resplendent gods. After it closed for the night we walked around the grounds in the warm night, the air cloying with the sickly-sweet smell of incense. Niteen sat on a bench, proud as punch, his legs swinging underneath him, too short to reach the ground. We met his brother - the one with the important position within the temple - as he locked doors behind us. He was tall, quiet and serious, as different as it was possible to be from his brother. A month or so later, we went en famille to Niteen's house to thank him and his wife and say good-bye, as we were leaving in a few days. "I have laminated the sketch you gave me," he said, "and it is on my wall." His quiet, pretty wife gave me a bag of samosas - a really big one this time, for which she wouldn't take a penny - I cooed over his adorable children and off we went. I returned to Mauritius the following year. 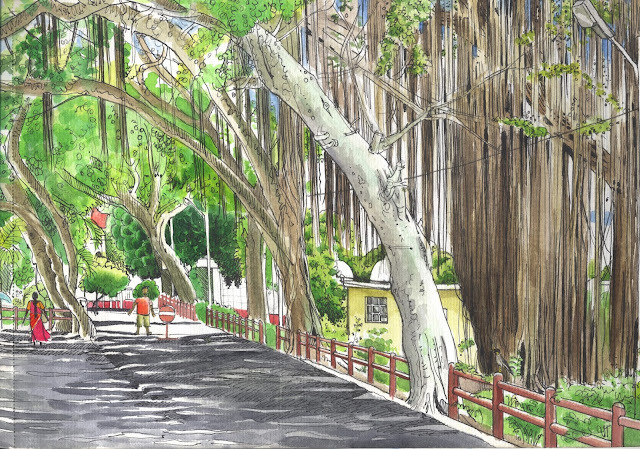 I'd wanted to draw the beautiful banyan trees outside the temple and so off I set for the temple in Triolet. I was happily drawing away when I saw a short, plump man heading towards the entrance gates, beside which I was sitting. It was Niteen. Quick as a flash I drew him in. When he saw me, he did a double-take of surprise and gave me a warm greeting. He laughed heartily to see himself in the sketch. "Will you draw my mother-in-law?" he asked. "She's just here at home. I'll go and get her." He literally lived opposite the entrance gates. I said I would and a few minutes later Niteen emerged from his house, barely able to breathe for laughter. I eventually made out that his mother-in-law had taken the proposition very seriously, and was standing in the middle of the floor, wrapping her best sari around her for her portrait. Then Niteen went back to work and said the good lady would be out shortly. A few minutes later a stern-looking lady came through the gates, glanced at what I was doing and walked on. I drew her in - that's her in the pink and red - but I can't be sure whether that was Niteen's mother-in-law. I like to think that it was. That was the last time I saw Niteen. To think that I nearly didn't get to know him, just because I was scared of strangers. Strangers? Friends I haven't met yet.